Atlantic City’s police surveillance center is helping to solve crimes in other towns. After Sunil Edla was killed in front of his Ventnor home Friday night, his stolen SUV was found in the 1600 block of Sewell Avenue in Atlantic City. Using their access to cameras throughout the city, officers were able to track the suspect through surveillance footage. After more investigation, a 16-year-old from Egg Harbor City was arrested in the 1500 block of Sewell Avenue the next morning. 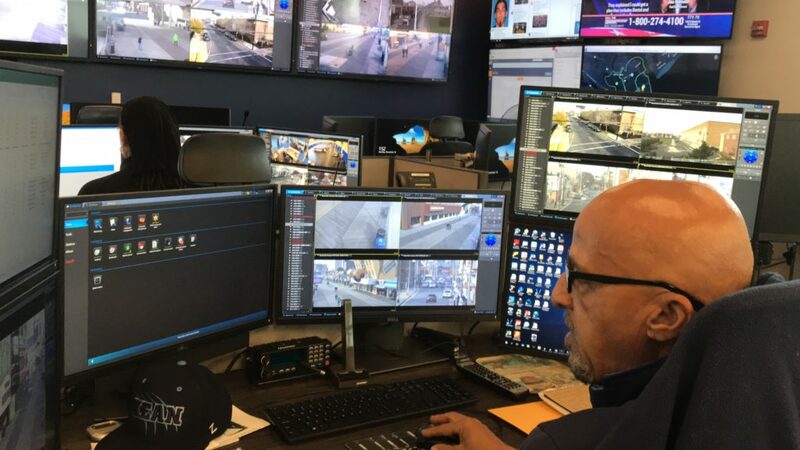 More than 18 months after opening the Atlantic City Headquarters for Intelligence Logistics Electronic Surveillance, or ACHILES, retired patrol officers are once again patrolling the streets of Atlantic City, seated in front of screens that can zoom in on nearly every part of the city. They have access to more than 1,400 cameras, including those of private businesses and homeowners through a PACT — Protecting Atlantic City Together. Eventually the department will provide signs to those sharing their cameras that will indicate Atlantic City police may be watching. “They’ve caught crimes in progress,” Sgt. Kevin Fair said of the retired officers who returned to work the surveillance center. One of the first cases, a suspect was arrested in a purse snatching. By backtracking, officers were able to find the victim’s purse — which had been thrown away. Protecting Atlantic City Together is a public-private partnership that allows police access to cameras owned by business and private residents. As 911 calls are entered into the CAD, or computer-aided dispatch system, they come up on a screen in the surveillance center at the same time dispatchers are relaying it to the officers on the street. The ShotSpotter audio gunshot-detection system also has a screen in the room, along with one showing the news and another showing a specialized Twitter feed. If a gunshot report comes in, officers in the room can zero in on that area, which can help in finding a suspect or potential victim. It’s much quicker than the old way, when people would call in gunshots with a guess of where the sound came from, said Deputy Chief James Sarkos, who led the project. Then officers would go to the area, searching for a sign of a shooting. That’s if gunshots were even called in. Many times fired shots wouldn’t even be called into to police. In some cases, there were even victims. Officers in the center are also proactive, scanning the screens for possible crimes, watching crime-prone areas. Before it finally closed down, the Fox Manor motel had a permanent spot on the wall television screens, Fair said. As he spoke, retired Officers Donna Green and Hank Davis shared information back and forth as they looked into a crime. “Their job it to just keep the cameras moving and looking for crime,” Fair said. There are at least two or three officers in the center for every shift, with seven stations that are all manned during big events. An eighth station is down in the Vice Unit, and can track all the same cameras. That doesn’t include the thousands of cameras belonging to the casinos, which police can access through MutuaLink. Sarkos showed a list of MutuaLink users, which are all over the country. “We could communicate with Orlando if we needed to,” he said. And the communication could be heard by whoever was part of the chosen group for whatever event was being monitored, via the Radio Network Integration Card. That allows all involved to hear the radios of the chosen group. PrevPreviousWill teen charged in Ventnor man’s killing be tried as an adult?